‘Royal Pine’ Beard Oil from Royal Beard Club is the last of the Royal beard Club oils that I have tested and even though its last, it certainly isn’t least! Royal Beard Club has managed to create a fresh pine scented Beard oil without it being reminiscent of a bathroom cleaning product. This of course is the risk when you use a scent that is also used as a toilet cleaner, but ‘Royal Pine’ Beard Oil from Royal Beard Club is fresh and woodsy and that is probably due to the fact that they have blended the Pine with Cedarwood. The blend of Pine and Cedarwood essential oils has been added to a base of 100% Argan, 100% JoJoba, Grapeseed and Sweet Almond carrier oils to create a beard oil that gives your beard a nice hold and leaves it looking good. The oil is absorbed well and didn’t leave my beard oily and greasy. 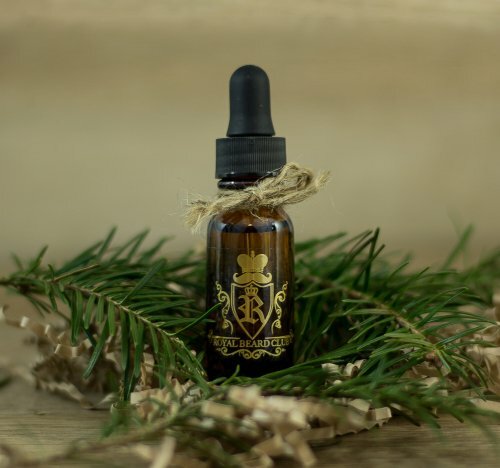 ‘Royal Pine’ Beard Oil from Royal Beard Club will not only make your beard look and feel great, it will also help to prevent beard itch and beardruff (dry flaky skin). The oils contained in Beard oils like this are just as important for the skin under the beard as it is for the beard hair. You can purchase ‘Royal Pine’ Beard Oil from Royal Beard Club via their website in a 15ml/0.5oz for $14.99 now currently $9.99 or 30ml/1oz bottle for $29.99 now $15.97. You can also keep up to date with Royal Beard Club on Facebook, Twitter, YouTube, Instagram, Pinterest, Tumblr, Google + and WordPress. From a home beard oil recipe to a variety of top quality beard care products on the market. Including beard oils, waxes, brushes, combs and advice on how to care for your skin, beard and mustache. Royal Beard Club has really blossomed into something great. At first it was never meant to be such a big brand in this market place. It was just a real solution for AJ Macaluso one of the co-founders of Royal Beard Club. He started concocting his own all natural quality beard oil blends from his New York home for his own benefits. Next thing you know a lot of the town barbershops and local bearded brothers were non-stop asking for more once they were handed a few samples. This is because his product was based on quality. This is when Royal Beard Club was born. AJ and his partners decided to really develop heir own premium blends of high-grade oils that are super beneficial not only for promoting hair growth but also aiding in maintaining your beard, stopping itchiness, giving a sleek shine and providing a long lasting incredible fragrance. Unlike other beard oils Royal Beard Club is built on pride, really producing high quality beard care products and building relationships with each and everyone of its bearded customers.